There are two basic arrangements, depending on whether the set is designed for use on AC and DC mains or on AC mains only. These are discussed in detail in below. In addition there are a few sets designed for DC mains only as well as battery valve sets - these are covered more briefly further down this page. The diagram to the right shows the power supply of a later AC only set (the Regentone A121). The transformer (T2) supplies all the valve heaters, which are connected in parallel, from a low voltage (normally 6.3V) winding. This winding also powers the other valves in the set (connection "a"). This is not an ideal arrangement because it puts considerable stress on the heater-cathode insulation of the rectifier valve (the cathode is at around 300V DC and the heater is grounded). However it is used frequently in sets employing later rectifier valves such as the EZ40 and EZ80. On earlier sets, the rectifier heater is powered from a separate transformer winding. This is to reduce the stress on the rectifier valves heater-cathode insulation, or when a directly heated rectifier valve is used. The diagram to the left (GEC BC5639) shows this arrangement with a directly heated rectifier valve. The heaters of the remaining valves are connected between "x" and the chassis (indicated by a thicker line). The rectifier heater will often be rated at 4V or 5V, while the heaters of the other valves will generally be 6.3V. The dial lamps (when fitted) are powered from the main heater winding, either from the full voltage or a lower voltage tapping. Running the lamps at a lower voltage considerably extends their working life, at the expense of some brightness. A separate centre-tapped transformer winding, typically 250-0-250V, is used for the HT supply. This is full wave rectified by V5. In the right diagram, C20 is the main smoothing capacitor. R17 and C21 provide further smoothing and decoupling. The mains transformer often has two or more tappings on the primary, for different mains supply voltages. For example, the Regentone circuit above has tappings for 110-120V, 200-225V and 225-250V. The selection is normally provided by means of a plug, screw or link-plate positioned either on rear of the chassis or on the transformer itself. On some transformers, there is more than one primary, the different sections being connected in series or parallel and to different tappings by means of a selector plug (this tends to be done on sets that have to accept a wide range of possible mains voltages). Whatever arrangement is used, it is important to check that it is set to the correct position for the local supply voltage in your area. In many parts of the UK, the supply is between 235V and 250V, despite the European compromise 230V nominal rating. The voltage selector would therefore normally be set to the highest setting. If the tapping is set to a lower position than the supply voltage, the valve heaters may be overrun resulting in reduced valve life. The power supplies of AC only sets are normally fairly reliable. If the HT supply is absent, check that the AC supply is reaching the anodes of the rectifier valve. In some sets, low value carbon resistors (typically 100R) are included between the transformer and the rectifier. If excessive HT current is drawn, these could burn out. This may well be an intentional design feature - the resistors are a cheap alternative to fuses, and are not likely to be replaced with something unsuitable by well-meaning owners. Mains transformers occasionally fail, but this is often caused by a fault elsewhere (such as a short circuit HT smoothing capacitor). You may be able to get transformers rewound or a replacement custom made, which is the best solution if you want the set to be as close to original as possible. Normally the easiest approach is to use a transformer from a scrap set. If the requirements are unusual, the best approach may be one of the transformer winding kits. Some time ago I used your site to locate potential suppliers of a mains transformer for a piece of German WW2 cipher equipment I was restoring at Bletchley Park. I contacted Majestic and Sowter. Majestic's "guru", who did all the historical rebuild work had unfortunately retired, and they could not fulfil the specification. Sowter however could not have been more helpful. I dealt with Brian Sowter (mainly) and Brian Last, and they helped to accurately specify what was needed and then built a drop-in replica for the rare machine (only two in the world) that I was working on. Absolutely first rate service. If the AC is present at the valve but the DC HT supply is absent, the rectifier valve is probably faulty. Check first that the heater is being driven. If there is sparking and fireworks inside the rectifier valve, there is probably a short circuit or heavy current demand on the HT supply. This is probably due to a faulty smoothing capacitor or maybe a fault in the output stage. A fault elsewhere is unlikely to draw sufficient current. Do not leave the set in this state for any time, as the risk of destroying the mains transformer is very high. You will almost certainly need a new rectifier valve, even if the transformer survives. Sparking inside the rectifier valve can also be caused by the valve itself being faulty. With AC sets, the valve heaters are connected in parallel as mentioned previously. If one valve heater fails, the remainder will still glow. British 9 pin valves with the E prefix and numbers from 80 (E80 series) such as EL84 have a heater voltage of 6.3V, as do the 8-pin E40 series. Most valve ranges used in AC only sets have heaters of either 6.3V, 5V or 4V. All the valve heaters connected in a parallel arrangement must be the same voltage rating but may have different current ratings depending on the heater power required for the valve. Rectifiers and output valves have higher current heaters than valves handling only small signals. When more than one heater circuit is employed, they are sometimes different voltages. For example, a separately driven rectifier valve heater may be rated at 4V, while the remaining valve heaters are 6.3V. The main drawback of AC only sets, as far as the manufacturers were concerned, was the cost and weight of the mains transformers. This could explain the popularity of AC/DC sets in the 50's, even though DC mains was uncommon at the time. In AC/DC sets (such as Bush DAC90A shown here), the valve heaters are connected in series. Therefore the current ratings are the same (often 100mA) and the voltages differ. If one valve heater should become open circuit, the circuit will be broken and none of the heaters will glow. The U40 and U80 series valves and most other British types have a heater current of 100mA. Some American sets and many valve television sets (P80 series valves) have 300mA heater chains. Other currents (such as 150mA and 200mA) may be encountered occasionally. The total voltage of the heater chain is lower than the mains supply voltage, and a resistor drops the remainder. In this set, the dropper resistor is left section of R17. It has a resistance of 950R and drops about 95V. At 100mA, this is a dissipation of 9.5 watts - which is quite a lot of localised heat and wasted power! Sometimes the dropper resistor is replaced or supplemented by a thermistor. The purpose of this is to keep the heater current more constant, reducing the surge when the set is first switched on and the heaters are cold. Mains supply voltage selection is arranged by additional resistors. In this case, additional tappings on R17 are included in the circuit when the voltage is set to the 225V and 245V positions. On the 205V setting, the additional resistance is omitted. As with AC only sets, it is essential that the correct setting is selected. In this set, the voltage selection resistors are in series with the supply to the whole set. On some sets, this just affects the heater circuit, and the HT is derived from the full mains supply voltage. The voltage selection is often provided in the form of a flying lead, which is connected to the relevant tag on the dropper resistor by means of a push-on tag or an eyelet that fits under a nut. A few sets (mainly later and higher quality models) have a jumper plug or similar arrangement on the chassis. Dial lights are sometimes connected into the heater chain. There may be a thermistor or resistor in parallel with them, to enable the set to keep working if one of the lamps fail. The dial lamps may alternatively be in series with the supply to the whole set (as in this case), probably shunted by a resistor or thermistor for the same purpose. Thermistor failure is not common, but it can be a problem when it does occur. The service sheets usually give no information about the cold and hot resistance. You may be able to extract a similar thermistor from a scrap set or obtain one from a dealer. Otherwise, you will probably have to replace it with a resistor or omit it altogether depending on how it is used. The dial lamps will probably not be running at maximum brightness when the set is warmed up and working normally, although they will (generally) be bright enough to illuminate the tuning scale. This increases the life of the bulbs, which is useful since the set will often not work at all if one of the bulbs has blown. During the initial warming up process the lamps will vary in brightness, and may be very dim or very bright depending on the circuit arrangement. The dropper resistor and voltage selection resistor are often contained in one component. This is often a green (or sometimes grey) tubular component with several tags, mounted on the top of the chassis. These high power resistors run very hot, and often fail by going open circuit. It is almost impossible to obtain a replacement of the same type, and the normal solution is to simply bridge the faulty section with a new resistor of suitable power rating. The resistors often have odd values; in this case the main section is 950R. The closest readily available resistor value is 1K0. If the faulty resistor value is midway between two readily available values, I prefer to use the higher value replacement. You also need to calculate the power dissipated and choose a replacement that can comfortably handle this. The formula is P = I2R where P is the power in watts, I is the current in Amps and R is the resistance in Ohms. In this case, a suitable replacement would be a 1K0, 10W or greater, ceramic resistor. This photo shows the faulty dropper in my Ekco U245, with a couple of replacement ceramic resistors mounted on it. When fitting the replacements care should be taken to ensure they are not too close to the cabinet side or anything else that might be affected by the heat. The leads should be short and tight to hold the resistor securely. Some restorers like to replace the dropper resistor with a capacitor, or a diode and resistor combination, to reduce the power dissipation. Further details are given on the Dropper Calculations page. Modifications can cause legal problems in some countries (including the UK and the EEC) because a modified set has to comply with current legislation. Please refer to the Modifications page. The DAC90A circuit is repeated here so you don't have to keep scrolling up the page to see it! The mains is half-wave rectified, to produce the HT supply. This is carried out by V5 in this set. R16 is a surge-limiting component, which protects the valve if the mains is switched off, and then on again while the valves are still warm. C22 is a suppression component, which prevents modulation buzz. This is a buzzing sound that is only present when the set is tuned into a strong signal. This capacitor often fails by blowing itself to pieces! The replacement MUST be suitable for direct connection across the mains. The yellow 1000V LCR polypropylene capacitors are suitable, but many high voltage capacitors are not. The best solution is a Class X or X2 rated component, which is designed for this specific purpose. The set will often work fine if the capacitor is omitted, but I prefer to fit a replacement. If the HT supply is missing, check that the AC supply is reaching the anode of the rectifier. The surge-limiting resistor (R16 in this case) is prone to failure, resulting in no HT. If the AC is present but the HT supply is absent, the rectifier valve is probably faulty. The comments given above for faults on the power supplies of AC only sets apply here too. AC/DC power supplies are inherently less reliable than AC only circuits. This is caused partly by the greater heat build-up in various parts of the circuit. The dropper resistor is often positioned close to the rectifier and output valves, both of which also run hot, so the localised heat build-up can be considerable. AC/DC sets were often cheaper when originally sold (particularly in later years); they were consequently lower quality than AC only sets and were not built to last. However, I am sure the manufacturers did not expect them to become collector's items 50 years later! They are generally smaller (because there is no large transformer to accommodate), which makes the heating problem more significant. They were often sold as second-sets for bedside use etc., and were not expected to be left running all day. Having said that, the majority of my collection are AC/DC sets, and I find their small size and widely varying styles most attractive. Live chassis receivers most certainly did not predominate the market in the UK, despite that fact that there were still many areas served by DC mains well into the 1950s. AC/DC receivers were not necessarily cheaper versions of AC-only sets; indeed, in the 1930s it was common for them to cost more. Nor was the quality lower than that of their AC-only counterparts as may be seen by looking at the specifications of receivers made by the well known firms of the vintage years. Some AC/DC sets have the dropper resistor incorporated in the line cord. This can be identified by the mains cable being thicker than normal. The length affects the resistance, so it must never be shortened. If you suspect that it has been shortened, check with the service sheet or measure the voltage across one of the valve heaters and compare this with the valve data. If it has been shortened or is badly damaged or faulty, you may be able to get a replacement from a valve radio dealer. Otherwise you could fit a suitable resistor inside the case of the set, but this would cause problems with heat dissipation. The idea of a capacitor as a dropper could be useful here. Some imported sets from countries with lower mains supplies (such as the USA) used very long line cord resistors to drop the excess mains voltage. If this is damaged or shortened, the best solution would be to convert the set back to its original home supply voltage, and power the set via a suitable external transformer. One most certainly does have a choice in how to replace resistance line cords by alternative mains droppers. Many early AC/DC midgets and small sets used 0.3A heater valves totalling no more than 63V for a TRF and 70V for a superhet. A mains dropper to suit 230V would have to drop between 160 and 167V, resulting in a dissipation of between 48W and 50W, which would be utterly unacceptable in a small cabinet. In the trade, back in the late '40s and early '50s we used to mount a standard mains dropper on a wooden block around which was placed a perforated zinc case. These little units could stand unobtrusively on the floor behind the radio sets, where the heat could be dissipated with perfect safety. The only thing I would add to Chas' comment is that the zinc case should be earthed for safety. It is therefore necessary to use three-core mains flex from the plug to the dropper, even though the radio itself only requires two-core. I have also heard of light bulbs being used for the same purpose. Because the bulb will not be run at full voltage, its resistance will be lower than normal. There will therefore be a degree of trial-and-error to establish the correct wattage bulb to give the required operating voltage. Start with a low wattage bulb and work upwards. You would still need to mount the bulb somewhere safely out of the way (it will probably not give enough light to be useful), but you do have the advantage that ready-made enclosed housings (bulkhead light fittings) are available. You also have the disadvantage that somebody may fit a different bulb in the future, causing damage to the set. Resistive dropper leads are banned in some countries - Australia is one. It is considered that they are too unreliable, a fire hazard and an electrical hazard if someone replaces it with a standard flex. A few earlier sets were designed to operate from DC mains only. The circuit arrangement will generally be fairly similar to that shown for AC/DC sets but without the rectifier and probably with a somewhat smaller smoothing capacitor. To operate form AC mains you will need to include some sort of rectifier, probably a larger smoothing capacitor and a surge limiting resistor selected to give around the correct HT voltage. Depending on the types of valves used, you may be able to operate the heaters from the AC supply as in AC/DC sets, but in some cases the heaters may double as cathodes (as with battery valves) so the DC potential is important for correct operation. You would then need to arrange a smooth and reasonably stable DC supply for the whole set. This would be best handled with an isolating transformer, as semiconductor bridge rectifier (full wave rectification) and a fairly substantial smoothing capacitor. This section cannot hope to cover all possible variations, so I will just briefly mention some alternatives I have come across or am aware of. Some continental AC/DC sets are designed for use on either 220V or 117V supplies. The heater chain is divided into two sections with their own dropper resistors. When the set is on the lower voltage setting they are connected in parallel, and on the higher voltage setting they are in series. Selection is usually carried out by a plug arrangement. Some AC/DC sets have a device called a barrettar to regulate the heater current. These are more common in American sets. This is intended to eliminate the need for voltage selection tappings. I have not come across one yet. Barrettars were used in a fair number of UK AC/DC sets right up into the 1950s and although more costly were better than a conventional mains dropper because of the automatic adjustment to differing mains voltages. A true barrettar has an iron filament in a hydrogen-filled envelope and should not be confused with the American resistance tubes having a conventional nichrome resistance element in what looked like an octal metal tube envelope. Some AC sets use a combination of AC and AC/DC circuit techniques. A few sets (including the Bush AC11 shown in the diagram above) use a series heater chain (U80 valves) driven by a mains transformer. The explanation given for this is that it allows the set to be converted to DC operation easily. My theory is that it was done because the series-heater valves were cheaper. Bush introduced the idea of series-heater valves in chassis that could readily be adapted for either AC or AC/DC operation in the late '30s and early '40s but the idea got really into its stride just after the war. 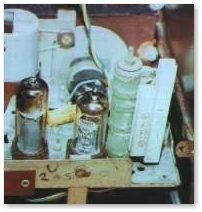 The great advantage from the manufacturing point of view was that all that had to be done to make an AC/DC set into a nominally AC-only set was the substitution of a small autotransformer for the dropper and a small alteration to the dial lamp wiring. The autotransformer was no bigger than a standard output transformer and obviously much cheaper to make than a standard mains transformer. A few sets (such as the Ferranti 125 in the diagram to the right) use a transformer to drive the 6.3V heaters, the HT being derived by rectifying the mains. The primary of the transformer is used as an autotransformer for the HT. Occasionally a small mains bulb is used as a dial lamp. This will normally be a 15W pigmy bulb with a BC or SBC base. In some cases, there will be a resistor in series with the lamp to reduce its brightness and extend its life, and this resistor often fails too! In the Bush DAC70 and VHF90A sets the heat from this lamp is sufficient to melt the plastic tuning dial surround. It would be advisable to increase the series resistor to decrease the heat and brightness, thus reducing the risk of further damage. My VHF90A has previously been fitted with a large 1K resistor for this purpose, and the plastic is in good order as a result. The HT rectifier is not always a valve. It may occasionally be a metal or selenium rectifier. This is more common on sets made in the late 1950s and the 1960s. Either of these devices could be replaced with a 1N5404 or similar silicon rectifier diode in the event of failure. If there is no resistor in series with the original rectifier, add a 220R 2.5W component in series with the silicon replacement. The purpose of this is to limit the initial surge when the set is first switched on (caused by the smoothing capacitors charging). Always use a pair of series resistors to limit current when replacing old selenium rectifiers with silicon diodes. Diodes are 20% more efficient. Use enough resistance to set the HT to the proper operating level. Also, use a good quality 0.01uF 1KV tubular capacitor across the HT secondary as diode transient/noise performance is not as effective as the original selenium units. Series pilot lamp as a fuse is not a bad idea while your at it. The rectifier will almost inevitably be followed by the smoothing electrolytic. This is normally followed by a decoupling resistor or choke and another capacitor to further reduce the ripple. On earlier sets, chokes were often used for decoupling and smoothing, with comparatively low value electrolytic smoothing capacitors (8uF or 16uF). As higher value capacitors (32uF to 50uF) became cheaper, the chokes tended to be replaced with high power resistors that were cheaper and less bulky. Some high quality sets continued to use chokes, as they are more effective at eliminating hum. Some earlier sets use an energised speaker. These days we are used to speakers containing permanent magnets, but earlier speakers used an electromagnet (due to the difficulty producing suitably high-powered permanent magnets at the time). The HMV 1117 (shown here) has two speakers, one energised and one permanent magnet. The energising coil (L22) is connected as the choke between C36 and C37. An additional coil (L21) is wound with the energising coil, and connected in series with the speech coil (L20) to cancel out hum. L23 is the permanent magnet speaker. The output valve anode current may be from the main smoothing capacitor or after the further smoothing. The remaining circuitry is powered from after the further stages of smoothing and decoupling. Ripple is not a great problem in the output stage, but on some sets it is cancelled out by including part of the output transformer primary in the smoothing circuit. This is mentioned in more detail in the Output Stages section. Some sets have fuses in the HT supply circuits, generally between the rectifier and the smoothing capacitor. This was quite common in later Murphy AC/DC sets. The fuse is usually rated at either 100mA or 250mA. When replacing, use the same rating but choose an anti-surge type. Often you will find that the fuse has been replaced in the past - normally with a 13A plug fuse that offers no protection. If you cannot establish the correct rating, 250mA is a sensible choice. A fast-blow fuse may blow if the set is switched off then on again while the valves are still warm, due to the inrush current charging the smoothing capacitor. When the valves are cold the HT current rises gently, but when the valves are hot it will come straight on. Anti-surge fuses are designed to handle brief surges outside the normal operating current, that are commonly encountered when equipment is initially switched on. Some sets have a normal 6.5V 0.3A dial lamp in place of a fuse in the HT circuit. At normal HT current of around 60mA this will not glow visibly, but in the event of excessive overload it will blow. The advantage of a lamp over the types of fuse available at the time is the surge handling properties. This arrangement is used in the HMV 438 in the Recent Repairs section. Regard the pilot lamp in series with the HT lead in the HMV 438, very effective fuse often found in early American military equipment, cost effective. A large number of sets have been imported from the USA and other countries over the years. These are often not suitable for direct connection to our mains. Continental 220V sets can be modified by adding a resistor in series with the supply to the set to drop about 25V. A 100R 5W resistor is often suitable, and could probably be positioned inside the set. Alternatively, you could leave the set as it is, and power it from an external transformer. A 220V set should not be powered directly from the UK mains as this may overrun the valve heaters, shortening their lives. 115V sets from the USA are more of a problem. Many of these will have been modified by the addition of a large dropper resistor internally, to drop the extra 130V. Some AC/DC sets from the USA (including an unbranded set I previously owned) use a 300mA heater chain, so the total mains current consumption is about 350mA. Thus in this case the dropper resistor was about 370R and dissipated some 45 Watts! This is a considerable amount of heat to dissipate from a localised point inside the cabinet, and can cause serious overheating. My set was modified this way when I obtained it, and the top of the cabinet became too hot to touch after the set had been running for a while. The heat had also caused damage to some components below the chassis. The best approach with these sets is to convert them back to 115V, and use an external 230V-115V transformer. I feel that if a set is designed for 115V mains it should be used that way. It also means you only need to buy one transformer, which you can use with all your 115V sets. If there is room inside the cabinet, you may be able to mount a suitable transformer internally. This would be a sensible idea if you intend to sell the set or are repairing it for someone who not understand or have another need for a transformer. Batteries for battery sets are no longer available. The normal supply required is 90V at about 12mA for the HT and 1.5V at about 150mA for the LT (Heaters). The HT could be obtained from ten 9V PP3 batteries in series, but this would be rather expensive and may not last for long. A single 1.5V D cell (HP2 size) would suffice for the LT, but again it would not last too long. An alkaline battery (such as Duracell or Ever Ready Gold Seal) would be much better in this position since the voltage does not drop off as the battery ages to the same extent as normal zinc-carbon cells. I feel that the best approach is some sort of mains power supply. This could be built in a case that will fit in the space previously occupied by the batteries. Commercially made power supply units are available from Valve and Tube Supplies on the Isle of Wight, England. The addresses and other contact details are on the Suppliers page. If you wish to build your own power supply, I have designed a design of a suitable unit, which is detailed here. Another alternative is a DC-DC converter to derive the 90V HT from a 12V rechargeable battery. Some sets are designed to operate either from the mains or from self-contained batteries. A popular example is the Ultra Coronation Twin (model R786) shown here. The set uses battery valves, and the heaters are wired in series. The battery supply is therefore 7.5V LT and 90V HT, which is connected to the terminals indicated. For battery operation the switches marked (B) are closed and those marked (M) are open. When the mains plug is inserted, these contacts change over. The mains is rectified by a metal rectifier (MR1) and smoothed by C24. R22 has tappings for voltage selection. R21 has a value of 1450R and drops about 150V, leaving 90V for the sets HT supply. R20 (1690R) is in series with the valve heaters, and drops about 83V. S7 and S8 are the power switch, ganged with the volume control. In some sets, such as the Roberts R66 shown to the left, a transformer is used, with separate windings providing the HT and LT supplies. The LT supply is well smoothed and decoupled to prevent hum. Metal rectifiers are invariably used, and these may require replacing with silicon rectifier diodes (1N4005 or similar). It is important to ensure that the heaters are operated at the correct current, as overrunning or under-running will significantly shorten the live of the valves. This is particularly the case with the 7-pin 25mA types (DK96, DL96 etc.). Although the heaters are rated at 1.4V, operation at this voltage for an extended period will shorten the life of the valves. The 1.4V rating is nominal, and the valves are designed to operate down to at 1.2V or possibly even lower to allow for the LT battery running down. When the set is operated from the mains, the heater voltage should be as close as possible to 1.3V. In some sets there will be a variable resistor in the heater circuit to allow the heater current and voltage to be set correctly. If you have replaced the rectifiers with silicon rectifier diodes, it is ESSENTIAL to check the heater voltage. Silicon diodes have a much lower forward voltage drop than the original metal rectifiers, so the heater voltage will be higher. If there is no adjustment provided, this can be corrected by increasing the value of one of the series resistors (R15 or R16 in the Roberts example) to achieve the correct voltage. 1.4V battery valves. Dismissing these as unreliable is a little harsh. Even in mains-battery sets they lasted very well in everyday use back in the '40s and '50s as I can personally testify. It was only when subjected to overrunning of the filaments that they became short-lived. In this respect, it should be noted that to replace the existing selenium rectifier in a mains-battery set such as the Ultra "Twin" with a silicon diode is to court disaster. The output from the latter type is so high compared to the previous type that unless very careful precautions are taken the valve filaments are bound to be overrun very severely. N.B. this stricture regarding silicon diodes applies to all sets in which they are fitted as substitutes for earlier rectifiers. If the set is not working, and you suspect that the valves have low emission, a quick (and somewhat naughty) test is to raise the heater voltage to 1.5V BRIEFLY. This can sometimes be achieved by setting the voltage selector to a lower setting. If the set then shows some signs of life, you can be fairly sure that a new set of valves will solve most of the problems. The 7-pin battery valves are fairly cheap (£3 each at time of writing) so it is generally best to replace the whole lot. It is important to use this "technique" as a brief test only. Otherwise the mains transformer, smoothing capacitors, valves and other components could be damaged by the excessive voltage.